The original meat shredding claws are often imitated, but these are the real deal—durable and Made in the USA. 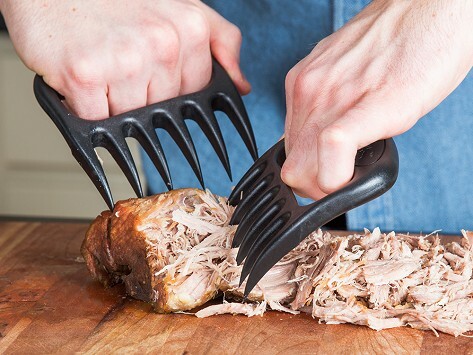 Six super sharp prongs easily shred meat, like pulled pork. They offer great grip to lift large roasts or turkeys, and hold them stable when carving. The minimal, ergonomic design is easy to grip and easy to clean, with almost nowhere for bits of food or juices to hide. This item was shipped very quickly & packaged well to prevent any damage. However it will be a gift and the person's birthday hasn't happenedppened yet so it will be difficult for me to review it because I won't be the one to use it. The recipient often makes pulled chicken or pork, using only a knife, his hands & maybe occasionally an ordinary table fork. I love these!! Makes dealing with large cuts of meat a breeze. I almost feel like a female Wolverine. Bear Paws are sturdy meat shredding claws that can turn you into a culinary Edward Scissorhands. 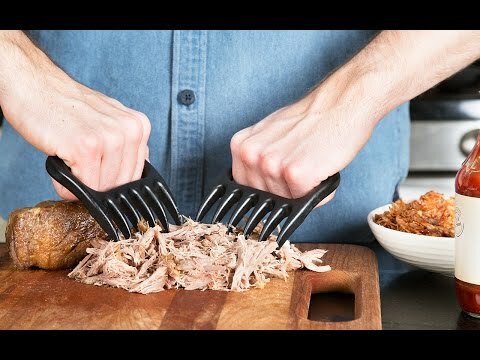 Grip these Made in the USA claws to easily shred pulled pork, chicken, or any other food you want to tear up. A simple design gets the job done quickly—thanks to six prongs on each—while limiting your contact with the meat. To do such a sensational job shredding, the Bear Paw prongs are super sharp. That also makes them handy for lifting roasts or turkeys, or to add stability while you’re carving and slicing. We’ve even heard of people using them to carry a watermelon, then hold it steady for carving. Hold the handles and the ergonomic shape contours to your grip. The minimal design means there’s almost nowhere for meaty debris or juices to get stuck. That makes them easier to clean—by hand or in the dishwasher. You may see other knockoffs that have a less sturdy design or aren’t American-made. But Bear Paws are the true barbecue champ.